Just imagine yourself spending a week or two far from the hustle & bustle of city life. A refreshing escape from your daily chores is much needed. If you’re planning to explore a new destination sooner than later, a Miami tour should be on top of your bucket list. For an affordable yet memorable experience, you can consider exploring Miami by a bus. At Sun Island Tours we have comfortable buses on hire that will take you to some of the most charming neighborhoods of this sunshine city. From the legendary hideaways of Coral Gable to the caffeinated energy of Little Havana – the magic city of Miami assures to offer you a taste of everything. Coral Gables, a historical setting in Miami which was built entirely from coral limestone unearthed in the area. The very moment you step into this historic place, you will fall in love with its beautiful boutiques & architectural splendors. Besides, there’re historical milestones such as the Biltmore Hotel that tells a lot regarding Miami’s imperial past. Coral Gables is situated neighboring to Miami, putting it within easy reach of the Port of Miami, Miami International Airport, Miami Beach and other destination. Exploring the relaxed community of Coconut Grove is a must whenever you tour Miami. Tangled between Highways US 1 and Biscayne Bay, this unique city provides tourists access to some of the most cherished art galleries. The community provides a warm, relaxed ambiance with enthralling boutiques, gourmet restaurants, sidewalk cafes and sailboats anchored at the bay. The area’s unique bohemian flair & lush tropical canopy make this one of Miami’s favorite neighborhoods for visitors and locals alike. If you can’t think beyond a fantastic shopping experience or wish to enjoy an authentic Miami cuisine, Miracle Mile has to be your place. Situated next to Coral Way between Le Jeune Road and Douglas Road, it’s home to a wide range of boutiques, over 70 restaurants and plenty of art galleries. Explore the lively Cuban district & acknowledge the true essence of multicultural Miami. Vivid murals, men playing dominoes while talking about politics and cigar rollers immersed in their work are some of the best things you’ll get to see here. 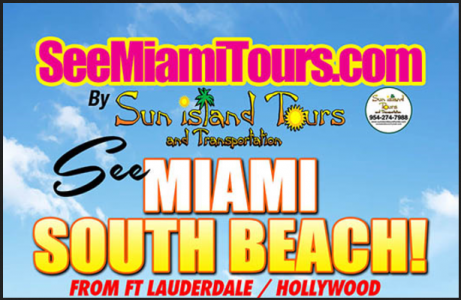 Contact Sun Island Tours now for affordable Miami Tours and Group Transportation. From 32 passenger buses to 56 passenger buses we have the right bus size for your group transportation. To book your group transportation, feel free to call us right now. Get in touch with us on 954-274-7988.